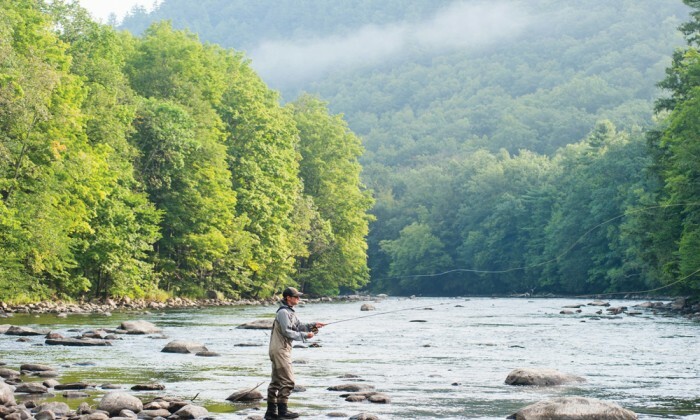 Winvian Farm, located in Connecticut’s Litchfield County, offers the quintessential New England experience— fishing included. Another idyllic summer may come to an end, but less than a five-hour drive from New York City, lush landscapes beckon. SNUGGLED AWAY IN THE NORTHWESTERN corner of Connecticut, Litchfield is littered with quintessential New England villages where narrow roads wind past farms, forested hillsides, romantic inns and antiques for sale from old frame homes ringed by white picket fences. 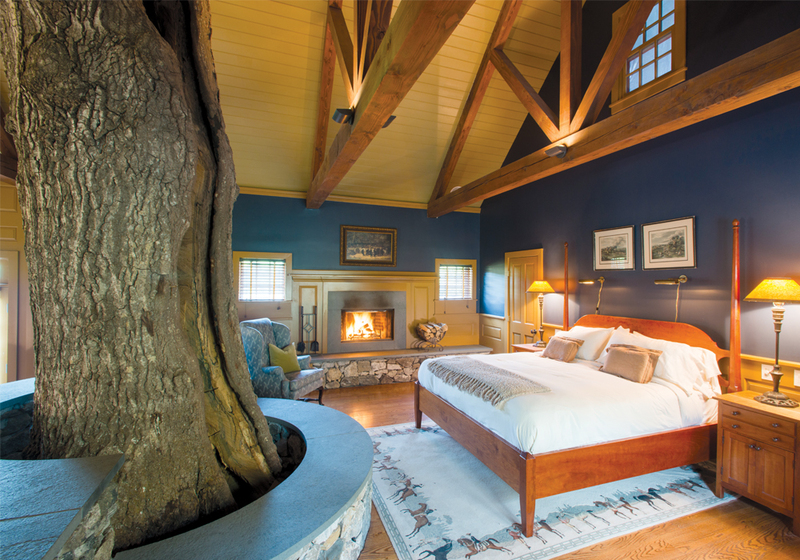 Given that Litchfield is the state’s most rustic county, consider booking the Woodlands Cottage, one of 18 luxe accommodations on the 113-acre Winvian Farm. The thematically charged, high-design cottages and suite in the main house are the articulations of 15 different architects, each telling a unique story (maritime, equestrian, artist, etc.). 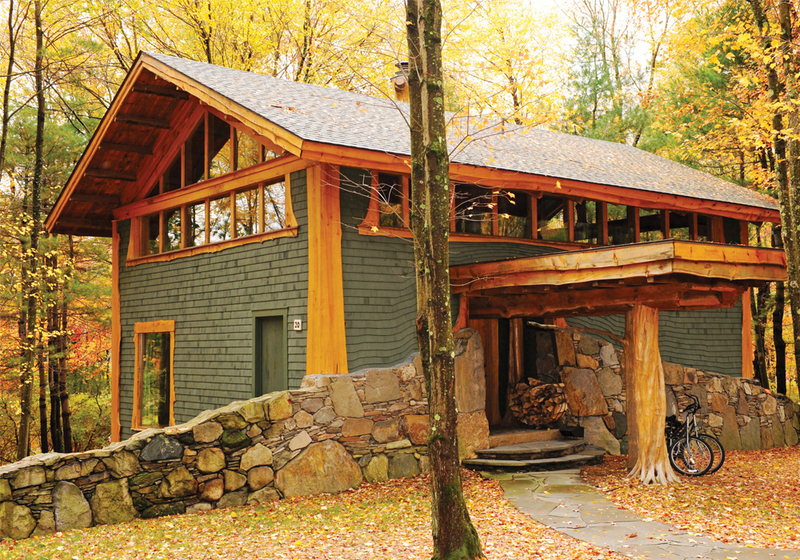 The Woodlands chalet features a mini waterfall, sinks fashioned from tree trunks and a shower lined with river rocks to reflect the same pastoral setting found in the adjacent 4,000-acre White Memorial Foundation, a spacious wilderness. Dine with Winvian Farm to taste its seasonal, locally-sourced ingredients or drive to the Community Table in Washington where the honey is sourced from a hive behind the restaurant and the chefs are known to forage for herbs and edible flowers. Step into the White Memorial Foundation and Conservation Center and feel like you were transported into the Connecticut of yore. In the property’s Catlin Woods, trails wander through a forest where the trees are more than 300 years old. These 4,000 acres in Litchfield remain wilderness thanks to Alain White, an environmentalist, and his sister, May, who established the foundation in 1913. Perched on a densely wooded ridge in Washington, the Institute for American Indian Studies vividly recounts the life of the original woodland tribes that occupied these lands. One highlight is walking through a re-created Algonkian longhouse where the tribe’s leader and his family would have lived. Outside, wander through the Healing Plants Garden where the specimens are labeled with their medicinal uses. For history and architecture aficionados, a self-guided walking tour of South Street in Litchfield, a town founded in 1719, is peppered with Federal, Colonial Revival, Italianate and Victorian-era style buildings. The Tapping Reeve House and Law School is the most historically significant, given that it was the country’s first law school. Exhibits and a re-creation of a classroom offer the perspective of 18th century students. For a meditative experience, stop at the Abbey of Regina Laudis in Bethlehem, where the women belonging to this cloistered Benedictine community make up an industrious and creative group. On the 400-acre property, the nuns farm, produce crafts and manage a dairy. If you’re lucky, you can purchase a wedge of St. Nectaire-type cheese, a product that owes its existence here to Sister Noella, who did her microbiology research in France on cheese production. But the community is most famous for singing ancient Gregorian chants. At 5pm on most days, the nuns to file into the choir and, for the next half hour, their voices saturate the soaring space. As your day winds down, wander to Haight-Brown Vineyard, Connecticut’s oldest continually operating winery. Established in 1978, it’s housed in a Swiss-style building where you can sip a fireside glass of riesling or chardonnay. GILDED AGE ARISTOCRATS and nouveau riche amassed enough wealth to vacation anywhere, yet they chose to spend their summers in Newport, RI. No wonder, considering the cool offshore breezes, sandy beaches, rugged cliffs and miles of green spaces. The vistas are stunning and the downtown area is hopping, making this boaters’ main stay a romantic multifaceted retreat. Start with the same unbeatable ocean views that first attracted Newport’s elite by taking the Cliff Walk, a National Recreation Trail developed during the Gilded Age. The path threads its way along the edge of craggy cliffs from Easton’s Beach (First Beach) to 40 Steps, a staircase down to the surf that once served as a weekend gathering spot for many of the mansion’s servants. Three-and-a-half miles from the start, the trail ends at “Reject’s Beach,” a sliver of sand abutting the extreme eastern end of Bailey’s Beach that’s reserved for the social elite. In between, peer into the spacious backyards of the palaces that front Bellevue Avenue. The Breakers, built for Cornelius Vanderbilt, is appropriately named for the massive waves that crash on the rocks below. Only the first third of the trail is paved, after which there’s plenty of rock hopping across some slick surfaces. For those who were infatuated with Downton Abbey, the Servant Life Tour at The Elms offers a behind-the-scenes exploration of how the “help” lived and worked at The Elms estate, including climbing 82 steps from the basement to the third floor staff quarters. But nature enthusiasts will find Newport’s and nearby Middletown’s outdoor spaces the most enticing. The Norman Bird Sanctuary, known for both its resident and nesting birds, is a land of juniper, marshland, ponds and ridges overlooking the ocean. Seven-and-a-half miles of trails crisscross this 300-acre landscape that was once a farm developed by early European settlers. A one-mile hike to Hanging Rock is the most popular, climbing some 70 feet above the surf. Adjacent Sachuest Point National Wildlife Refuge, another migratory bird sanctuary, sits on 242 acres of grassland, sand dunes, marshland and rocky coastline on Middletown’s southern tip. The refuge juts into Narragansett Bay and provides a perfect site for waterfowl. Trek along the Ocean View and Flint Point loop trails, stopping for the views at any of the three observation platforms. Brenton Point State Park, just off Newport’s Ocean Avenue, sits right on the edge of the water. Many visitors come to what was once the grand Davis Estate because of the sweeping views of Narragansett Bay, open lawns and perpetual breezes—the sky is often dotted with an impressive array of kites in all shapes and colors. Can’t get enough of the ocean views? For dinner and drinks and an idyllic sunset (weather permitting), head to the Lawn at Castle Hill Inn. Settle into an Adirondack chair, sip rosé champagne and dine on oysters and littleneck clams. 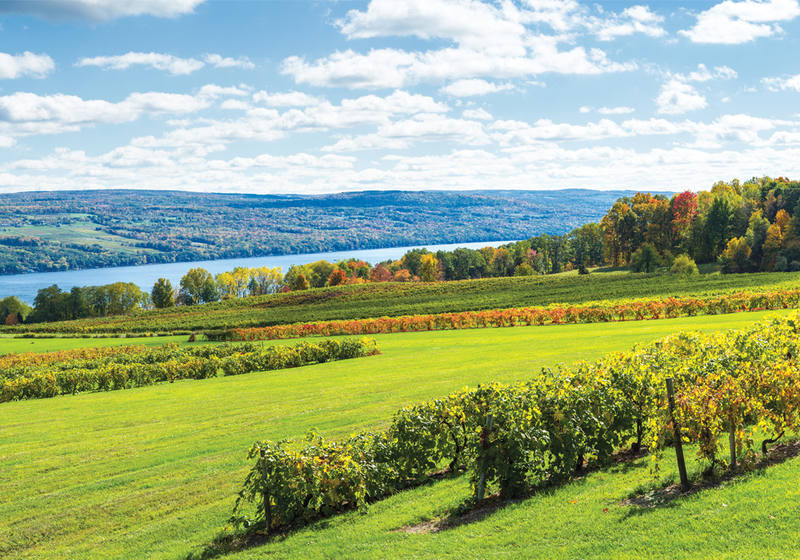 Western New York’s bucolic Finger Lakes’ region includes Seneca Lake, one of 11 slim, glacially derived bodies of water. At 38-miles long, it’s the biggest, which can make for some pretty views or a day well spent on the water fishing or renting a boat. But this pastoral landscape offers much more. Dozens of wineries make it an oenophile’s paradise, it is carpeted with pastures, orchards, dairies and quaint shops that can be explored or just admired while passing by. Charming towns line its shores and the village of Watkins Glen is positioned at the southern tip. Check into the Blackberry Inn Bed & Breakfast. Innkeepers David Hertel and Brian Eslinger recently converted this 19th century Greek Revival farmhouse into a welcoming, three-bedroom retreat that’s walking distance from shops, galleries and wine bars. Breakfast is a not-to-miss affair that embraces the area’s locavore sensibilities. Hertel is also a prolific artist whose evocative abstracts of the surrounding landscape grace many of the public spaces. More contemporary art can be found nearby at the barely one-year-old Quintus Gallery that has a perfect lakefront location. This former factory has a multi-level, industrial interior where sculptures, oils, mixed media and acrylics are displayed in tiny alcoves along the stairwell in addition to the grand, sun-filled main exhibition space. Openings are held monthly and have included the works of such respected artists as Linda Bigness and Diana Godfrey. Among the many entrepreneurial ventures appealing to the senses is NOTE Fragrances, just a fifteen-minute drive up the east coast to Hector, where owner Danielle Fleming opened a sniffing bar. Fleming creates many of the scents based on her experiences in the region and offers visitors the option to be a perfumer for the afternoon and create a custom scent. A quick five-minute jaunt brings you to bucolic Lodi and Rue Claire Lavender Farm and Artisan Chocolate. The small, sunny shop radiates a touch of the French countryside, complete with antique cabinets, dried flower wreaths and an adjacent plot of land redolent with the lilac-hued blossoms. Owner and chocolatier Claire Benjamin is constantly devising unusual flavors, whether it’s a white chocolate truffle with rose petals and pomegranate, hazelnut bay leaf ganache, or, for the adventurous, chocolate-covered onion. For a more substantial nosh on the return trip, Global Taco back in Watkins Glen is like a mini culinary United Nations, serving tacos with round-the-world flavors. Kobe beef, kimchi and sweet chili sauce compose the Korean taco while the Persian comes with black pepper chicken, cantaloupe, honeyed cream and slivered almonds. Or venture a little south to Montour Fall’s Pi Truck, a solar-and wind-powered operation baking and serving pizza as it roams around the east side of the lake. Owner and pizza maker Sam Maggio bakes five different ultra-thin crust pies a day plus one special. 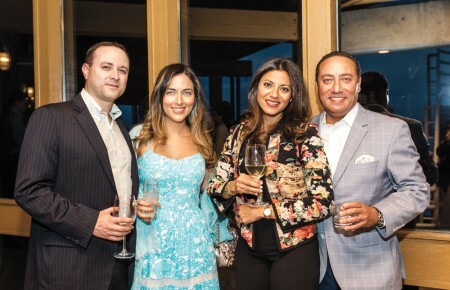 Elevate taco night with vino and entertainment at Damiani Wine Cellars—on bocce ball night Global Taco parks near the court. The Cellar on the lower level is casual, decked with natural light and views of the lake. 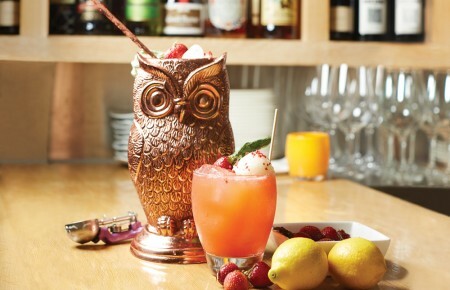 For something more upscale, GRAFT Wine & Cider Bar is a fine choice. The contemporary restaurant dishes locally inspired seasonal plates. The slim menu is focused on shareable tapas that have included Moroccan spiced local carrots with mint, dates and yogurt. Leave room for a slice of the scrumptious pie.